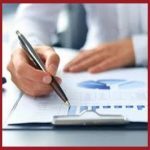 GE Evicted From The Dow | Investor Resources Inc. It has been decades since General Electric lost its glitter. The only original component of the Dow Jones Industrial Average has been replaced by Walgreens Boot Alliance (WBA). Officially, Walgreens is classified as a consumer staple company though it seems to carry more of a pharmacy reputation in the northwest. As the separation date drew near, the mutual funds, pension plans and multitude of investors following an index strategy had no choice but to abandon the company. The hope of seeing the stock price recover to 2008 highs became increasingly improbable. A major flaw of indexing as a strategy is the lack of attention to the components. Committees make decisions slowly. If you have ever served on a board, you probably have a personal story of validation. However, your portfolio should have some conditions for retaining any individual investment. 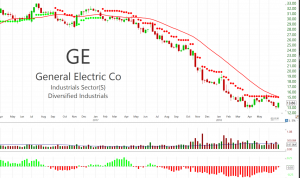 The chart below provided two significant warnings about GE. First, the upward trend of price changed in early 2017. Second, institutional selling was accelerating as pension and fund managers dealt with the impending eviction of GE as indicated in the lower part of the chart. The Dow Jones Average still retains some industrials. The new components have added technology, but not Face Book, consumer staples and healthcare. Our economy is no longer growing from industrialization. Baby Boomers wealth is still the primary driver with increasing use of technology and healthcare. Expect this trend to persist for a few more decades. Click Here for a list of companies in the Dow Jones Average.